Jenks Library has a lot of resources. From the over 100,000 books, to the 50,000 online journals, 150+ library databases, and over 140,000 ebooks it can be a little overwhelming at times to know what the Library has and what's useful. The Resource Spotlight page is intended to showcase key and maybe at times obscure resources available for all students, staff, and faculty to use. It is also the space where you can learn about any current trials of resources. Check out the resources we currently have on trial or recently added and tell us what you think! Go to the Library Database page and look for the "New/Trial" column on the right. A useful strategy for research is to identify an organization method that works for you as you gather your research. Keeping yourself organized as a research will help you better make connections between sources and help further your ideas. One tool you can use to help keep yourself organized is Zotero. Zotero is a reference management software that helps you store, organize, and cite information. 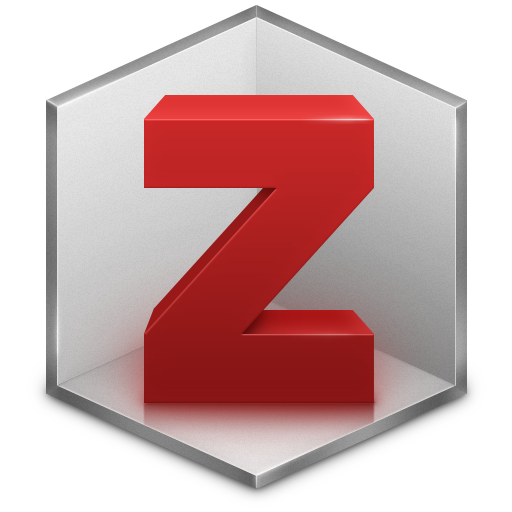 The Zotero tool is available for Mac, Windows, and Linux users. You can choose to download "Zotero for Firefox" which will link with your Firefox browser or download the "Zotero Standalone" option which will allow you to use the web browser of your choice. If you are using the Standalone client, first download Zotero and then add the appropriate browser extension for your prefered web browser. Download the Zotero Client for either Firefox or the Standalone Client for the web browser of your choice. Once you have download the client, you can then add extensions for your preferred web browser and Word or LibreOffice. Are you ready for this year's Social Venture Challenge by CEL? So are we with our database Small Business Resource Center. This is a great resource for anyone with an entrepreneurial spirit who needs key information on how to start a business, write a business plan, craft a marketing campaign, launch a product or business, and more. This resource features business and trade journals, handbooks, encyclopedias, podcasts, and over 700 business plan templates. From restaurants, to online shops, to consulting firms, Small Business Resource Center has the information you need to start your own business. 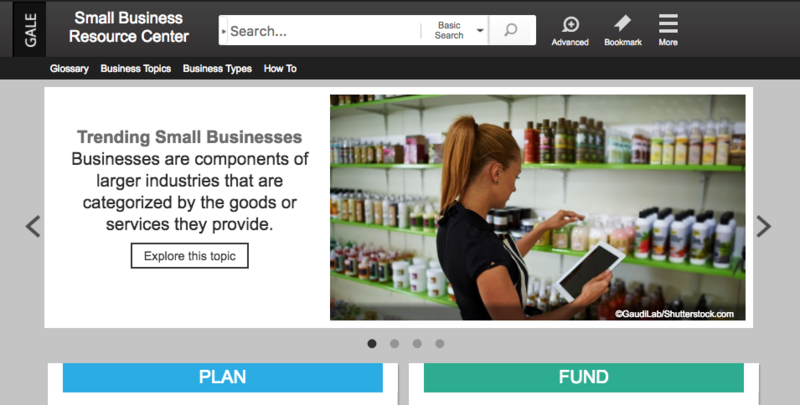 Easy-to-browse homepage features four key business stages - plan, fund, start, and manage. More than 700 business plan templates. Indexed collections of small business eBooks, 300+ journals and magazines, and directories listing thousands of associations, consultants, consulting organizations, trade shows, business information sources, and more. Overviews, news, magazines, journal articles, and recommended web resources keep small business owners up-to-date on their industries. 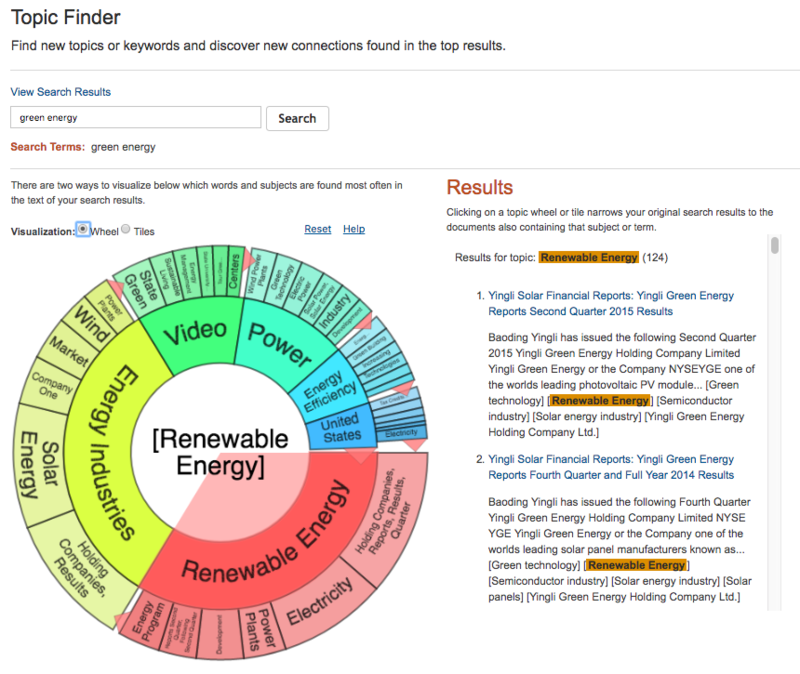 Topic Finder helps make visual relationships between concepts and terms, and supports basic and more advanced researchers. This tool takes the titles, subjects, and approximately the first 100 words from a subset of your top results and feeds them into an algorithm. Keywords shown in the graphics are those found most often in the text within your search term. The topic for "Illinois" might bring up expected connections from the text like "Chicago," along with unexpected but commonly related terms like "water," "steel," and the names of people who appear frequently in documents about Illinois. The challenges, motivations, successes, and failures of history's notables can be educational and inspiring to researchers and Biography In Context offers authoritative reference content alongside magazine and journal articles, primary sources, videos, audio podcasts, and a vast array of images. The research tool covers more 400,000 international figures and is continuously updated to ensure that researchers have access to the very latest information on everyone from Martin Luther King Jr. to Dr. Dre. For those who are more visual learners, Biography In Context offers images on the homepage that have hot spots that when scrolled-over show additional content and details associated with that image. This is a feature exclusive to this research tool. With Global Issues In Context, users can examine issues as reported through the news, global viewpoints, reference materials, country information, primary source documents, videos, statistics and more in a single search. Authoritative content is updated daily through more than 660 geographically diverse full-text newspapers, magazines, and journals for a truly global view. This brings essential, balanced information to everyday researchers, as well as to those across academic disciplines. 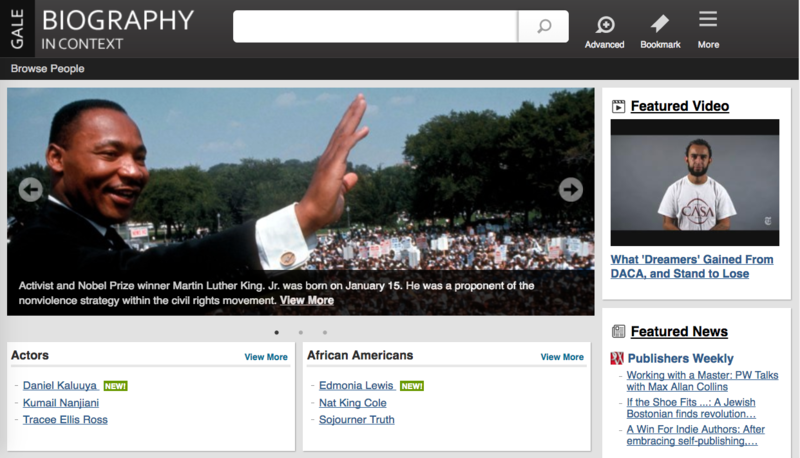 Current viewpoints and historical context on issues and events, organizing issue-portals into user-friendly categories. Expert perspectives – without U.S. filters – offering analysis of business, scientific, cultural, political, social and religious issues. An intuitive interface with extensive video, audio files, interactive graphs/tables/charts, podcasts, images, maps and statistics. More than 400 full-text English-language news sources, magazines and academic journals. More than 250 issue portals with topic overviews and global perspectives, reference and primary source documents, statistics, periodicals, Web sites and multimedia. 193 country portals featuring in-depth cultural information, statistics, maps, flags, encyclopedia articles and more. MP3 audio files for every text document. 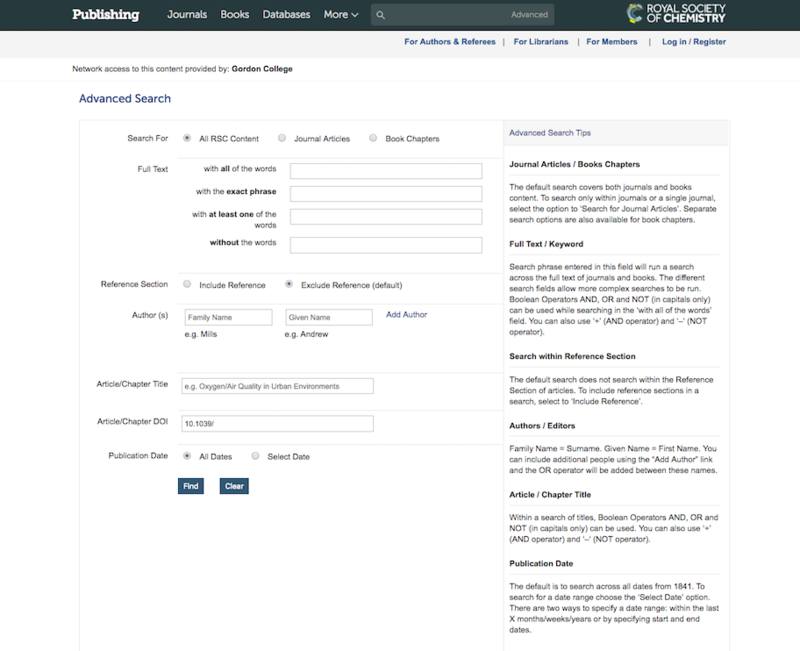 Jenks Library has a new resource to help improve your searching experience why you are looking for scholarly journal articles. Through BrowZine's simple interface, you can search for journals by name or browse for journals by subject and with few clicks get connected immediately to the full-text of the article. BrowZine provides access to journal content from 2005 to the present, but Jenks Library often has access to a lot more than that. To view older context, select the "Change Year" button and then the grey "View all issues available at your library." This will connect you the landing page in Journal Finder where you can click on the access option within your articles date range. In addition to providing quick searching and full-text display, BrowZine also allows you to save favorite journals in "My Bookshelf" and to save favorite articles in "My Articles." To save journals or articles, you must have a BrowZine account. To create an account, go to either the My Bookshelf or My Articles tab and follow the prompts to sign up. BrowZine is also mobile friendly! Download the BrowZine app today to read your favorite journals from your phone or device. What are you doing this summer? Why not visit so Mass State Parks? 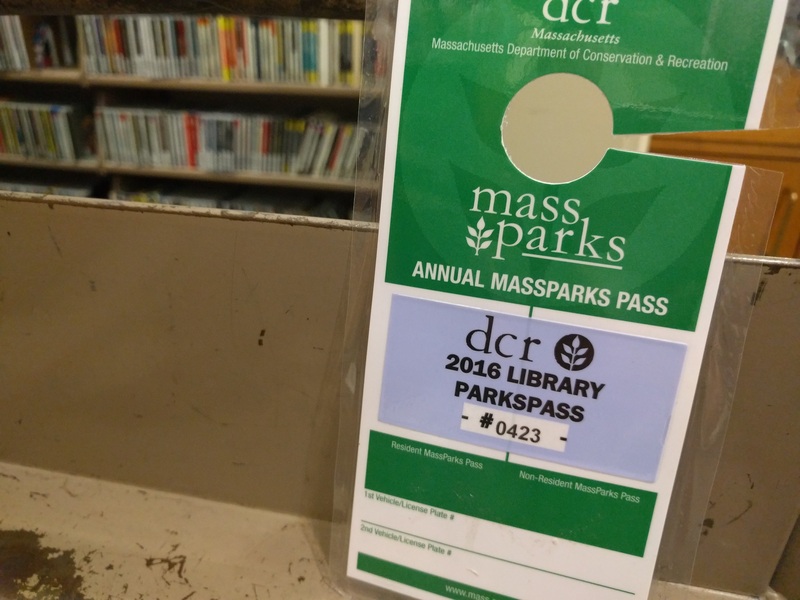 Jenks Library has recently acquired two MassParks passes which can be checked out for use by Gordon faculty, staff, and students. Each pass admits one vehicle and covers day use parking fees for over 50 facilities where parking fees are charged. Passes circulate for a three day period. Search for more Massachusetts state parks by either name or region from the MassParks website. Also available from their site is a recreational activity search engine where you can search for parks that offer your favorite activity. Swimming, hiking, fishing, birdwatching, MassParks has a little something for everyone! ​Ever notice when your searching for books in the NOBLE Catalog how many options there are for eBooks? Well there's a reason for that. Jenks Library has a subscription to two ebook collections both offered through EBSCO. Together these collections offer more than 142,000 ebooks available in our catalog. That's a lot of books. 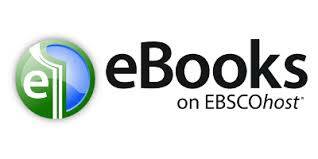 Accessing ebooks hosted by EBSCO is easy. Run your search in NOBLE Catalog. Scan the search results to find books of interest and take special note of the format of the book (print or ebooks). If you choose an ebook option, the link to access the book will be available under the basic information about the book. 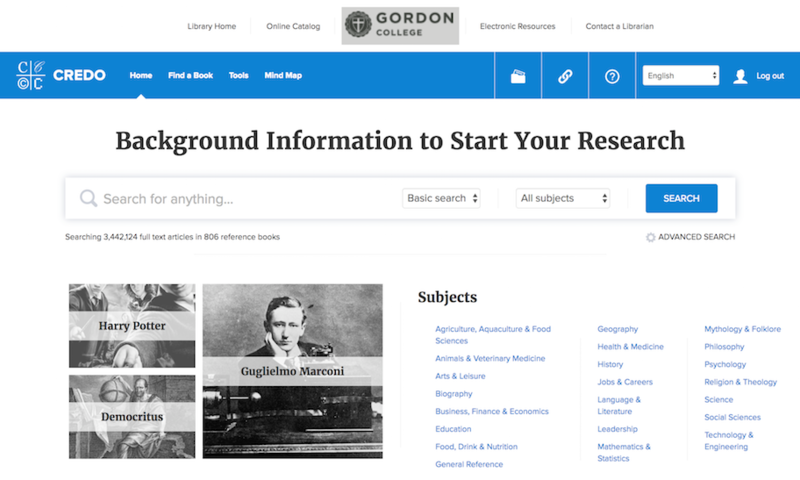 Links to eBooks available through EBSCO will say "Access for Gordon College via EBSCOhost." Click on that link and the eBook will open in a web browser. You can start reading anywhere in the book by selecting a section in the table of contents. The book will open in the EBSCO eReader and you can skip through the book, browse, search and more! The EBSCO eReader also has additional tools that can help you cite, save, and take notes while you're reading. Cite: select from a list of major citation formats to add the book to your bibliography. Save Pages: save page sections or chapters as PDF to view and access later offline. Up to 100 pages can be saved at one time. Dictionary: use the dictionary search feature to look up any words while your reading. Search Within: search within the ebook by keyword to help you quickly scan to the section of the book that will be useful for you. Search NOBLE Catalog today and check out one of our EBSCO eBooks. Other eBook options that you may encounter while searching are direct links to PDFs from the book's record or links to eBooks from Overdrive. BioOne is a nonprofit publisher with the purpose of making scientific research more accessible. 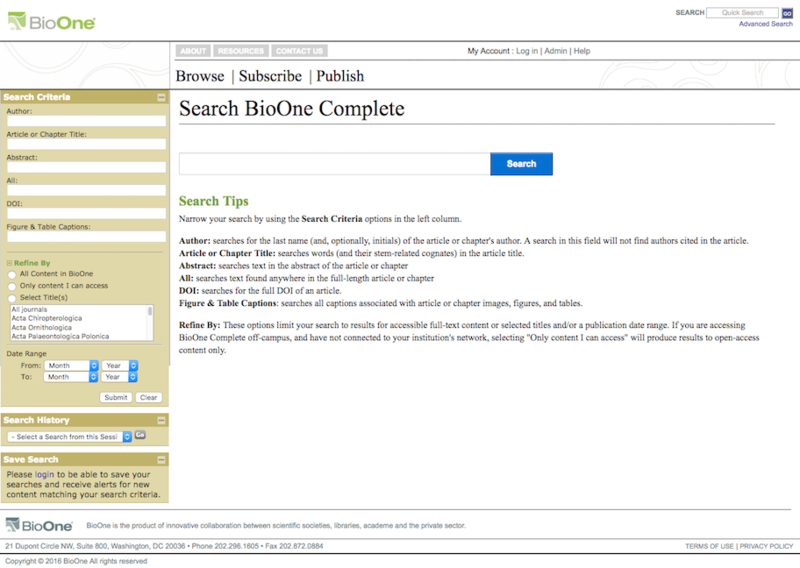 BioOne provides full-text access to over 150 academic journal titles in subject areas such as biology, ecology, and environmental science. Popular titles include: The American Biology Teacher, Biology of Reproduction, BioScience, Journal of Insect Science, Journal of Mammalogy, and Journal of Wildlife Management. 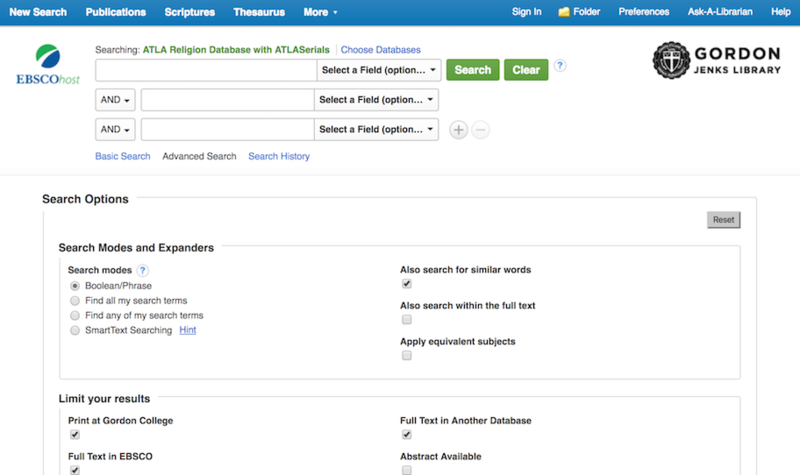 ATLA Religion Database with ATLASerials (EBSCO) provides indexing and full text of major religion and theology journals. Coverage begins in 1908, providing historical as well as current thought and perspective. A unique feature in ATLA is the ability to search for a specific scripture citation and find articles covering the verse. From the advanced search page, in the top search boxes, just select the field “Scripture Citation” and enter a scripture reference. Beginning a research project? CREDO Reference is a great place to start. You can search or browse over 10,000 topic pages containing overview articles, definitions, images, and reference articles. Credo topic pages also link out to other library resources such as the online catalog and EBSCO databases. When you enter a keyword search in Credo, you will explore topic pages as well as articles from 600 reference books. Topic pages appear at the top of your results. In the left menu, you can narrow your results by subject, type of entry and other criteria. Following a link to one of Jenks Library’s databases or the online catalog will carry your search term over to the new resource. Credo's Concept Map is an interactive tool that will help explore relationships between ideas as you expand or narrow your research topic. The Gadgets feature helps find specific kinds of information such as a definition, a person, an image, or a quotation. The Royal Society of Chemistry is the world's leading chemistry community, advancing excellence in the chemical sciences. Started in 1841 and later granted a Royal Charter by Queen Victoria, the Royal Society of Chemistry has been providing access to chemistry literature for over 100 years. Their peer-reviewed journals cover content in the core chemistry sciences including related fields such as biology, biophysics, energy and environment, engineering, materials, medicine, and physics. Popular titles include Chemistry World, Green Chemistry, New Journal of Chemistry, and Russian Chemical Reviews. 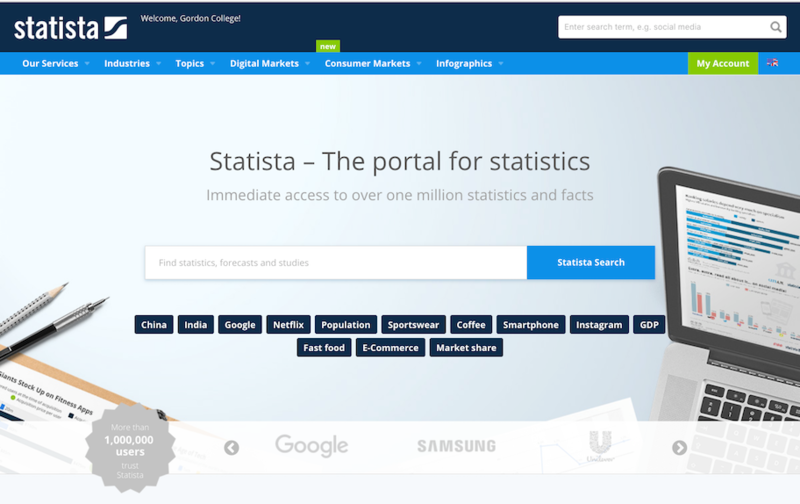 Statista is a statistics portal integrating statistics, quantitative data, and other related information on over 60,000 topics including: media, business, finance, politics, technology, travel, and more. Through this trial we have access to Statista’s wide range of reliable statistics, infographics, dossiers, and more. Data can be easily downloaded in a variety of formats such as embed codes for incorporating charts and infographics on websites, excel files for statistics information, or PDF files, images, or PowerPoint for charts and infographics.